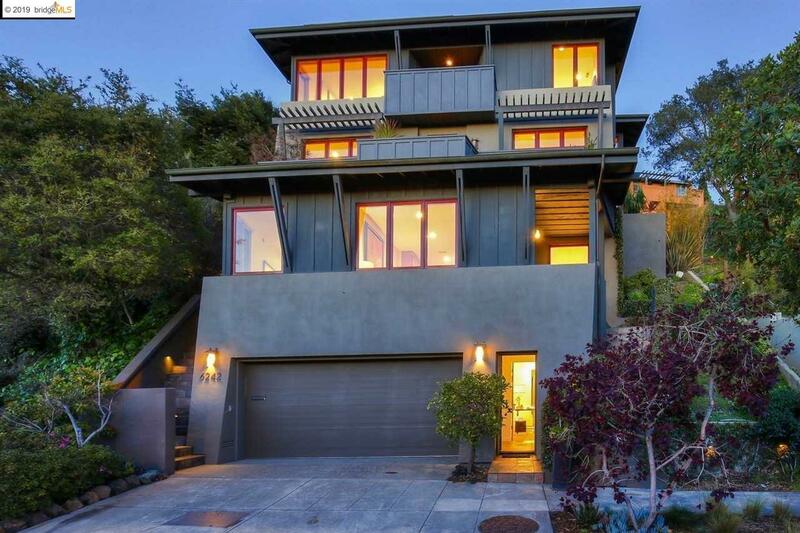 This Contemporary Mark Becker Craftsman is situated with nearly every room looking out at SF/Bay views, and lush greenery. Hand-plastered walls meld seamlessly into rich wood detailing, defining the spaces and flaunting fine craftsmanship. The open floor plan combines main floor living/dining rooms with an expansive chef's kitchen on a mezzanine above, and cozy den. A front balcony spans the width of the houseâperfect for entertaining and savoring sunsets. Three ample bedrooms and two full baths include the master retreat, with fireplace and walk-out balcony. A professional home office sits on the street level, with a separate entrance, waiting area and half-bathroom. An enviable man cave, yoga studio, or music room would also work well here. The second floor is home to a private guest suite, with one bedroom, a full bathroom, kitchenette, living room and views, with a cozy patio/entry. From within the 2-car garage, you'll be happy to note the elevator which connect the levels.